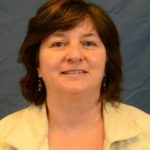 Kancheepuram (Guna) N. Gunalan, Ph.D., P.E., D.GE., F.ASCE, vice president of alternative delivery at AECOM, and Robin A. Kemper, P.E., LEED AP, F.SEI, F.ASCE, a senior risk engineering consultant for Zurich Services Corp., are the official nominees for 2018 President-Elect. The nominees recently sat down with ASCE to record their responses to questions posed by ASCE members. The election for ASCE officers opens on May 1 and closes on June 1. 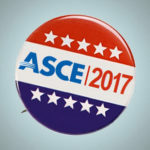 A new voting process using your ASCE email and password makes casting your vote easier than ever. Paper ballots are available upon request by contacting Patty Jones, managing director of Executive and Board Operations, at pjones@asce.org. For more information on the election, visit asce.org/elections for a complete list of nominees. Eligible voting members will receive voting information by email on May 1. Please check your spam filter to allow ASCE messages to be delivered. Just use your member login to cast your ballot. Before you cast your vote, take a minute to learn how the President-elect nominees view the issues most important to you and to the future of civil engineering. Watch the videos below and visit the election page to read their bios and vision statements. Don’t forget to vote by June 1! Watch Guna’s overview statement. 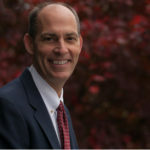 Visit his election page to read his bio and vision statement. Watch Robin’s overview statement. 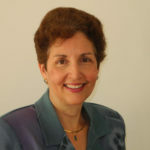 Visit her election page to read her bio and vision statement. What challenges does the civil engineering profession face for the 21st century, and what should ASCE do now to address those challenges? Robin Kemper and Kancheepuram Gunalan offer insight on how to address the challenges ASCE faces in the 21st century. What do you see as the opportunities and challenges for ASCE and civil engineering under the new administration? Kancheepuram Gunalan and Robin Kemper discuss how we stand to benefit and the challenges of progressing civil engineering under the new political administration. How can ASCE remain relevant and financially strong given the growing competition from online communities and for-profit competitors? Robin Kemper and Kancheepuram Gunalan share their ideas behind keeping ASCE essential and valuable to its members. What will you do to help engage younger engineers in ASCE? 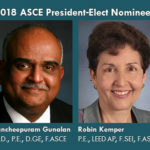 Kancheepuram Gunalan and Robin Kemper explain how each plans to engage younger engineers in civil engineering and ASCE as potential president. How can I see the vision statements of the two nominees? I prefer this to watching a series of videos. 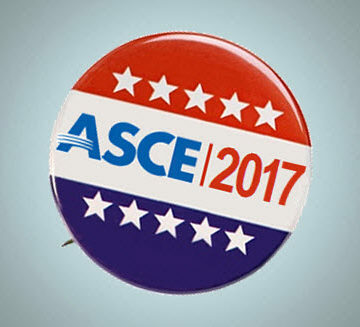 This ASCE News article includes links to each candidate’s bio and vision statement. I have posted a question for each canidate.